At the end of last year, I did a post about the best type of embroidery thread to use for thirteenth, fourteenth and fifteenth century counted embroidery. However, to achieve the best results when making your own reconstructions and interpretations, it's not only important to use the right thread, but also the right type of fabric. Among most reenactors it seems to be an unwritten law that the ground fabric par exellence for counted embroidery has to be linen. Never have I seen anyone (and that includes myself, I confess) use that other common type of medieval fabric: wool. However, from extant pieces, we know that during the late middle ages both linen and wool fabrics were used for counted work. In part this may be because white wool fabric that is woven in tabby weave, is not fulled (so that the individual threads are still clearly visible), and not woven too tightly is rather hard to find nowadays. I have been trying to locate a supplier for quite some time now, but to no avail. Four purses from Tongeren, Belgium, were embroidered on a woolen ground. They are all dated to the late thirteenth or early fourteenth century. One of them is embellished with the coats of arms Jan II of Brabant and Limburg and his wife Margaret of England. A second purse in the same collection also carries the coats of arms of Brabant/Limburg and Bourbon. Two other purses are embroidered on wool as well. One of them supposedly made in Spain (although there is no argument given for this attribution). The last one has an openwork pattern of eyelet stitches. All the purses and other brick stitch embroideries in the collection of the Victoria & Albert Museum are, according to the museum website, embroidered on a linen base fabric. The provenance of these purses is mostly Germany. Because at least two of the Tongeren purses carry the coat of arms of local noble families, it is quite likely they were produced more or less locally, so probably within the Duchy of Brabant, or perhaps in Flanders. Possibly then, woolen ground weaves were a feature typical of embroidery made in these regions (this is just a hypothesis, I need more data to back it up - or down, for that matter). Depending on what type of embroidery you want to make, you'll need a fabric with either a very low or a higher thread count. I tried to gather some data on the thread counts of ground fabrics of preserved embroidered pouches and other objects. Sadly, this information seems rather sparsely published. Modern embroidery fabrics are usually even weaves, meaning that there are as much threads per cm in the warp as in the weft. As you will see in the data below, with medieval ground fabrics this was certainly not always the case. In the graph above you can see a summary of the data detailed below. As you can see the most used thread counts were between 8 and 22 threads per cm; with a concentration around thread counts of c. 10 for coarser work and c. 20 for fine embroidery. 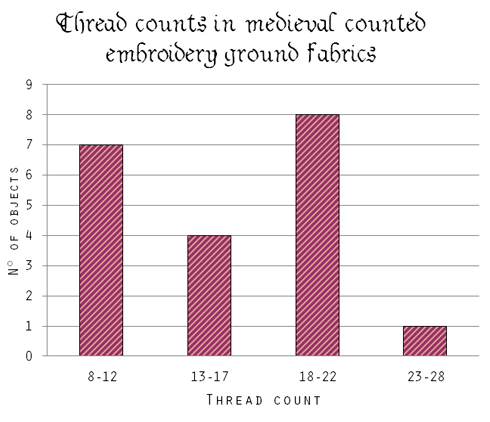 These data of thread counts of the medieval embroideries in the collection of the Victoria and Albert Museum are taken from Richard Wymarc's 'A Stitch out of Time'. When you click on the inventory numbers you'll be taken to the V&A Collections website for more details on each item. Wymarc does not specify whether his thread counts are counts of the warp or the weft, or if they were the same in both directions. I assume here that they are even weaves. The following table presents the thread counts of six purses found in the Onze Lieve Vrouw Geboorte Church in Tongeren, Belgium. When you click the catalogue numbers you can view images and more info on each purse. The thread counts are taken from the catalogue (Tongeren Basiliek O-L-Vrouw Geboorte. Textiel, Leuven, 1988). According to Frieda Sorber's findings in the book, the ground fabrics were all even weaves. A c. 1300 brick-stitch purse from Maastricht has a linen base fabric with a thread count of 20/22 (warp/weft). A fourteenth to fifteenth century embroidered cushion from Westphalia, Germany. It is currently in the Kunstgewerbemuseum, Kulturforum in Berlin. The thread count of the linen ground fabric is approximately 25/30 threads per inch or 10/11 per cm (as measured by Joyce Miller). A more detailed description, photos and a pattern adaption can be found here. A fourteenth to fifteenth century corporal box with an embroidered cover, also at the Kunstgewerbemuseum. For the embroidered cover different ground fabrics have been used. Joyce Miller counted 27/25 threads per inch or approx. 10/10 threads per cm on the bottom and sides of the box, and 44/26 threads per inch or 17/10 per cm on the lid. The warp threads on the lid are extremely fine, and the weft is fairly thick. Where the stitching was worn in some areas, Joyce Miller could confirm that the that the brick stitches did indeed cover only two threads each, instead of the more usual four. Of course, counted stitch embroidery was not only done in silk during the late medieval period. Another popular type of counted work, at least in some regions - especially Germany - was whitework; mono-color (mostly) embroidery of white linen thread on a white linen ground fabric. I do not have detailed information on thread counts of whitework tablecloths. All I have is Jenny Schneider's brief description of a number of embroidered Swiss linen tablecloths. In these tablecloths mostly counted stitches are combined with stem stitches and/or split stitches. So linen that is too fine/tightly woven doesn't work for counted stitches, but linen that is too coarse/loosely woven doesn't work well with stem and split stitch. A third point to keep in mind is the weave density of your ground fabric. Using a fabric where you can easily distinguish all the separate threads makes your life as an embroidered so infinitely more pleasant. On the images below you can see a fabric with a thread count of 14 and on the right of 10. Even through there are more threads per cm in the 14-count, the openings between the threads are about the same size as the 10-count, because the threads themselves are thinner. So, what you're looking for is a fabric that is fairly loosely woven, so that you can easily count the threads, but not too loosely, because then the threads might shift and move a bit, which is also a pain. It's ok to use fabric that has a different count in the warp and weft. And hopefully this will make one more happy embroiderer/embroideress! * There seems to be some disagreement as to whether this fragment in woven or embroidered. Wymarc describes it as a piece of embroidery, while the V&A website claims it is woven. Frieda Sorber, in describing a stylistically similar piece from Tongeren (no. 35) has the same opinion as Wymarc. I have emailed the V&A about the matter, but am still awaiting their reply. I made a full size replica of the antependium from rekjahlid a few years back, and since there wasn't much wrtten on it, and the nice man at the museum really wasn't much help, I automatically did it on linen because that's what you're always told to embroider upon. about halfway through the project I came across some additional documentation that said the antependium was on homespun wool fabric. So the next project I did on manx tweed and Found I loved it, and then I found a nice tabby that I use when I teach, and I kept findng more and more examples on wool. It seems obvious when you think about it, becuase sewing is always easier and smoother if the ground fabric and thread are of the same fibre.